The giraffe step stool is made of oak lumber and a branch from a maple tree in my yard. I stored the branch in my basement for approximately two years to insure the wood was dry. I manually scraped the bark off and sanded the underlying wood to a silky smoothness. 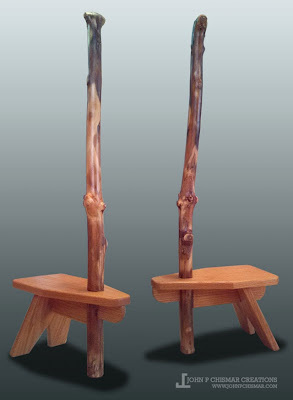 The step support is connected to the branch using a through mortise and tenon joint. Once the branch and the support were set and square adding the step and legs was easy. The completed piece is finished with Linseed Oil and Polyurethane.